The Certificate IV in Ageing Support (CHC43015) reflects the role of support workers who complete specialised tasks and functions in aged services; either in residential, home or community based environments. Workers will take responsibility for their own outputs within defined organisation guidelines and maintain quality service delivery through the development, facilitation and review of individualised service planning and delivery. Practical placement of 120 hours is required which All Health Training will organise on students' behalf. Practical placement may be commenced after week 8 of the course and must be completed within 1 month after the course conclusion. 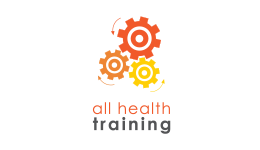 Students will be required to wear an All Health Training polo shirt and name badge (both provided) on placement. In addition, long black pants & black closed in, non-slip shoes will be required which students will either need to provide or purchase at their own cost. If a participant is currently working in the aged care sector you would be required to demonstrate working in the role for 120 hours. This can be done via payslips or a letter from your workplace that we can verify. Police checks are required prior to commencing practical placement which we will organise on our students' behalf. If a student has a Disclosable Court Outcome registered against their name, we are unable to assist with placement as industry will not accept students without a clear record. This requirement is not negotiable. Please note, in Victoria this includes any offence that may have occurred up to 10 years ago and will show offences that state they are "without conviction". Students are strongly encouraged to obtain the flu vaccine for aged care workers. Upon successful completion of this course, you'll receive a nationally accredited Certificate IV in Ageing Support (CHC43015) from All Health Training. Employment outcomes include varying roles in organisations, primarily in residential aged care and home and community care settings.